Brownies are my weakness. There I said it. Now don’t go using it against me! You can wave lollipops and candy corn in front of me for as long as you want, I won’t take ’em. Too sweet for me. These are my favorite brownies on the planet. I have never tasted one that I like better. I make them all the time, but this time, I wanted to add a little something. Frosting. Coconut frosting. 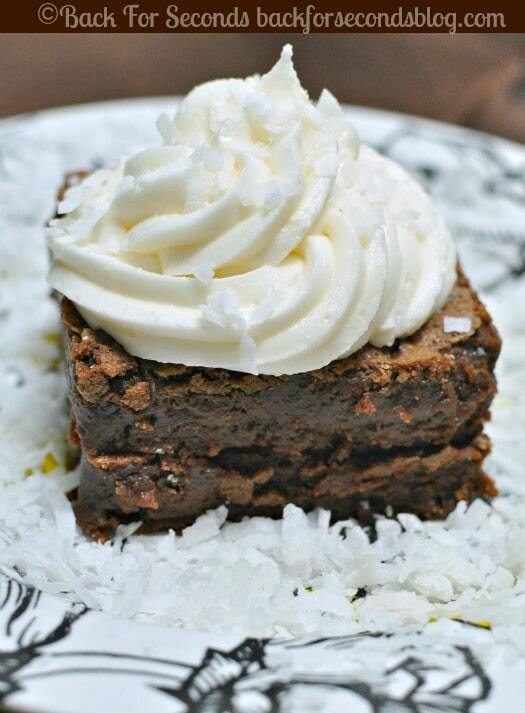 I went a little overboard when piping the coconut goodness on this particular brownie. It seemed the frosting to brownie ratio was a bit off. No big deal, just add another brownie! In a large microwave safe bowl melt the butter and stir in the cocoa until well incorporated. Add in the sugar, vanilla, salt and eggs, stirring well with a wooden spoon after each egg addition. Slowly stir in the flour until well blended and smooth. Pour into a greased 9×13″ pan and bake for 22-24 minutes or until toothpick inserted comes out clean. Do not over bake, you want these nice and fudgy! Let cool before frosting. 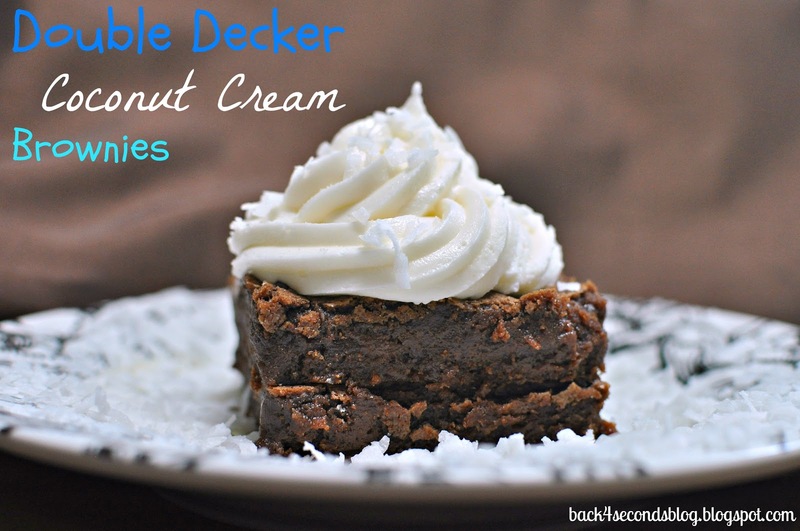 Beat together butter, sugar, coconut extract, and 2 Tbs of coconut milk. If too thick add more coconut milk 1 Tbs at a time until it reaches the desired consistency. « Ice Cream Scoop Cookies – Fabulous Foodie Fake Outs! Oh yum! Thanks for sharing at Snips and Spice Sunday Slice. I featured you this week! Wow, those look absolutely fabulous! I HAVE to give these a try. Thanks so much for sharing! I’m heading to the kitchen right… now! These look and sound fabulous! 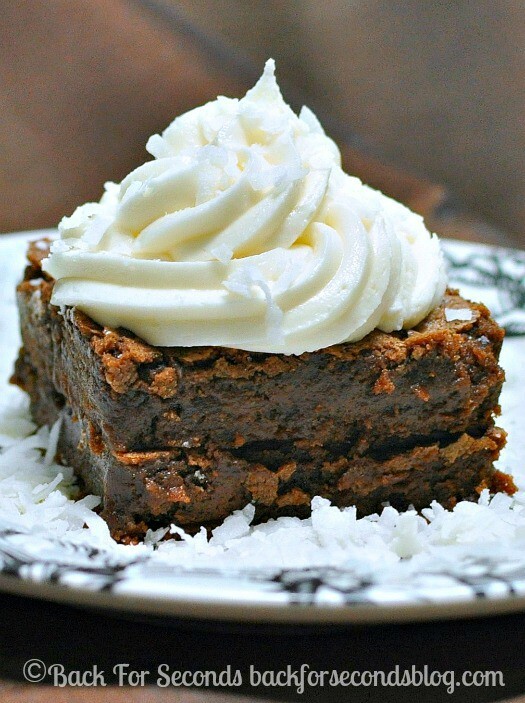 I’m a brownie lover too…and a rich dessert lover as well! !